Abu Dhabi: With the participation of more than 300 healthcare providers and experts in “Sports Medicine and Nutrition” conference, Zayed University came to highlight and discuss its promising researches that can enhance the performance and well-being of athletes at the Rosewood Hotel in the capital. The two-day conference is organized by the Mediterranean Conferences Organizing Company (MCO) in collaboration with the Abu Dhabi Sports Council, Health Point Hospital, Abu Dhabi Knee and Sports Medicine Center, and Zayed University, as the academic partner. Under the theme of “Evaluating Performance Through Sport Medicine and Nutrition”, the conference was held to highlight the importance of sports medicine and provide a unique platform to discuss the latest medical approaches that impact the performance and well-being of athletes. “The Contribution from the CNHS made it clear that a good diet can help people get the best fitness and sports results. The nutrition experts from CNHS also presented evidences that sports nutrition plays a key role in optimizing the beneficial effects of physical activity. It is important to maintain a healthy weight, eating well is crucial. If athletes are looking to lose weight for sport, strictly reducing protein, fat or calorie intake can not only have a negative impact on one performance, but it can severely harm body. Hence, there should be proper dieting plan,” Professor Howari added. Around 15 Zayed University students participated in the two-day conference and presented their research work on sports medicine and nutrition. Khulood Ali Mohsen Shugaa was among students and part of the UAE National Hockey Team. Malin Garemo, Chair of the Department of Health Science at the CNHS, said: “Disordered eating has been identified among athletes at all levels, from high schools students who do sport as recreational activities to professional athletes. Teachers, coaches, trainers, fitness instructors need to be educated about behavior and characteristics such as changed training habits or dieting without a need to lose weight to mention a few to be able to detect individuals at risk at an early stage and to support athletes to seek help and get needed support from health professionals. The conference also highlighted contemporary treatment for most common injuries facing sportspersons, and the technologies used to enhance their performance and healing, through the sponsors and exhibitors. Amani Saqallah, Instructor at Zayed University, also expressed her excitement to be part of the Sports Medicine and Nutrition conference, which plays a vital role in serving the community by conveying a compelling message about sports, nutrition, and healthy living. “Weight loss can be intentional, such as from dieting and exercise or unintentional and be a sign of illness such as cancer. Weight loss can result from a decrease in body fluid, muscle mass, or fat. A decrease in body fluid can come from medications, fluid loss, lack of fluid intake, or illness such as diabetes. The loss of weight and lack of nutrition associated with a chronic illness is referred to as cachexia. Unexplained, unintentional weight loss is often a result of illness and should be evaluated by a health care professional,” she said. 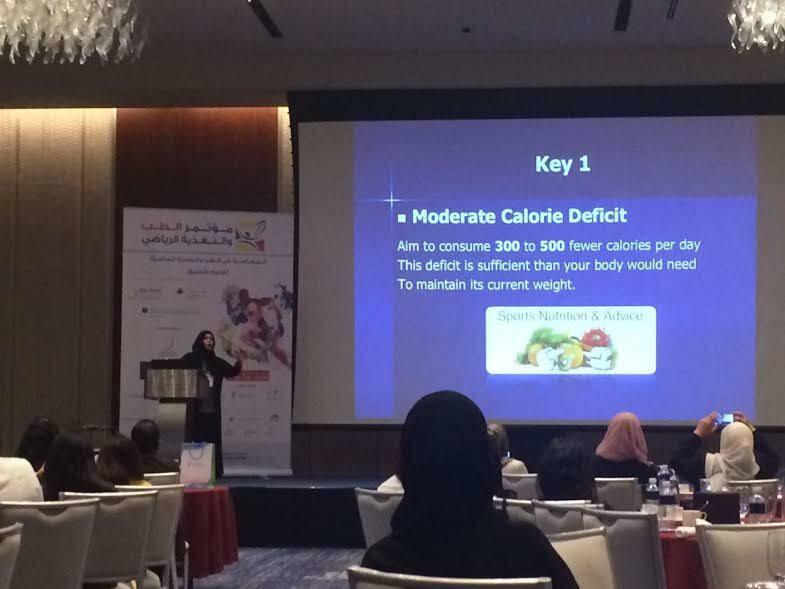 During the conference, Amani urged athletes to strengthen their nutrition care plan interventions, provide more focus and regular nutrition education, and hire a nutritionist in every club or training center in the country. “Athletes are often under a lot of pressure to be at a certain weight for some sports. This often causes athletes to lose weight in unhealthy ways, such as skipping meals, using diet pills or laxatives, or vomiting. Unhealthy dieting can lead to unhealthy eating habits or eating disorders (anorexia or bulimia). Unhealthy dieting and heavy exercise many also affect health. It may also affect the growth and development of young athletes,” she added.